We strive to create simple and authentic recipes with as few, ethically sourced ingredients as possible. That’s why we partner with Jesse Straight, owner of Whiffletree Farm. 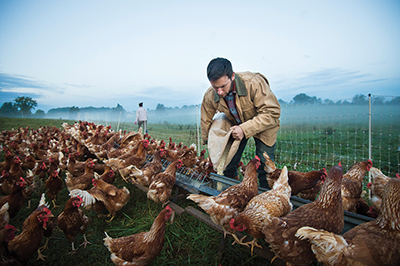 Located in Warrenton, VA (just outside of Washington, DC), Jesse provides us with local eggs from ethically raised hens, and we couldn’t be happier to support his growing business! Below, Jesse explains the importance of ethics in food choices, and why he does what he does! What are three key things you’d like our readers to know about you and Whiffletree Farm? If I had to limit it to three things, I would want your readers to know that we work really hard to raise our chickens, turkeys, pigs, and beef cattle to thrive naturally so that we are a benefit to the health of the land, animals, eaters, farmers, and our community (can that count as one thing?)! Two, that we want to earn our customers trust by showing them our good work (try our food, call me, come to the farm!) Three, that we are grateful for their support! What should people consider when choosing where to purchase their food? Farming practices! And then if that farm’s location, delivery, customer service, etc will fit into the customer’s life. 1. Are the animals being constantly rotated onto fresh pasture/woods? 2. What feed are the animals eating? Hopefully non-GMO without chemicals! 3. Are the beef totally 100% grassfed? 4. Are there any chemicals being applied to the land (pesticide, herbicide, fungicide, fertilizers)? 5. Are the animals being treated humanely and respectully of their natures? 6. Does the farm practice transparency? Can you see everything you want to? 7. Does the farm have good customer service–communicate professionally, deliver on time, etc. Love! Care for my family, care for the land, animals, our eaters, and my hometown community! Why is eating local important to you? Local farmers are the best ones to care for the land, animals, eaters, and community! We care! And we have models that allow for good farming. Of course, just being “a local farmer” doesn’t mean the farmer is doing the best job, so do your homework! What has farming taught you about life in general? Farming has taught me humility. Even if we aren’t always aware of it, we humans are so dependent on the sun and biological systems that support our life 3 times/day. And it has taught me how some of the best things are built slowly and steadily over a very long period–like the rejuvenation of soil health or a forest’s health. And it has taught me how fun it is to be this closely intertwined life springing forth! How do you balance family life with running a successful farm? It is tough, like anyone who has a small business, but I have the added advantage of our model of farming is very family/kid friendly. Often my kids enjoy coming with me as I work with the animals. And I often eat 2-3 meals/day with my family. But yes, I work long days. However, on the other hand, the commute is great! Thanks to Bakefully Yours for having the good taste and integrity to source from our well-raised hens! I hope you all will give them a high five for that! And come visit us and see the animals!